The Freewheelers are an unofficial group affiliated with MI-6. The genesis of the group, one which usually consisted of three teenagers, two male and one female, came about when the first three to become the team found themselves involuntarily mixed up with trouble by a former Nazi named Von Gelb who wants very much to undo the terrible calamity (his opinion) that was the downfall of the Third Reich. The three young people, Bill Cowan, Gregory Phillips, and Mary Maude, were having considerable trouble staying alive against Von Gelb and his rather extensive enterprise when they got unexpected but much needed help by Colonel Buchan (or Buchanan, I've seen it both ways but the former is most prevalent). The Colonel was an experience agent with MI-6 and well aware of the danger posed by Von Gelb. He was also smart enough to know that those these young adults were not trained operatives with years of experience, they were undoubtedly resourceful and, due to their predicament, already deep in it. So, without planning but also with considerable incentive, the group which would come to be called the Freewheelers came into being. The idea of using non-professionals for particular missions was not new to MI-6 or Buchan but to employ such young people was and with the new alliance would come a lot of learning problems for both the trio and their unofficial leader. The make-up of the Freewheelers would change occasionally as eventually each member would move on with his or her life. Cowan would hang around for some time while Phillips would be replaced with Nick Carter and soon after Maude would make room for Olga Yevchenko. That young woman would soon step aside for Fiona and so on. Mike Hobbs and Sue Craig and Steve Walker would show up after a bit and stay for a good time but even they would move on. Even their boss, the Colonel, would leave, getting a promotion placing Major Colin Wade in his stead. No matter the make-up, or the adult leadership, the Freewheelers would prove over and again that they were a very valuable, and entertaining, part of the British Secret Service. The television series on which the two books were based had been around already for three years (4 seasons) by the time the first of the two books appeared on the shelves. As mentioned above, the membership in the Freewheelers would change a fair amount over time but at the point the books were released, the membership consisted of Mike Hobbs, Sue Craig, and Steve Walker and it is these three who make up the Freewheelers in the books. Diplomats all of the world are disappearing, kidnapped. It is the job of the Freewheelers and their colleagues in MI6 to find what is going on, a mission that will take them from England to the Persian Gulf and back. A few very unhappy tigers in a circus play a part. As mentioned below in the Comic Book section, IPC Magazines' Look-In weekly publication had for a while in each issue two page serialization of stories. The third such adventure lasted four issues but unlike the other four stories were in text form instead of graphic, so the story is shown below. 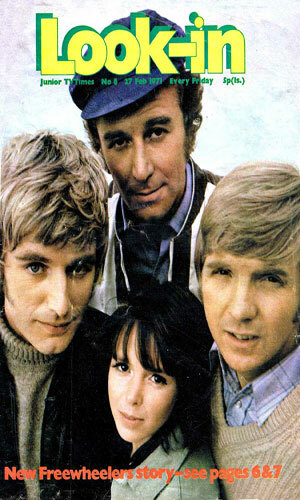 When I first saw information about the Freewheelers, I made the erroneous conclusion that it was a Mod Squad rip-off being about three teenagers who went to work unofficially for the government, albeit British instead of American and in the spy business versus crime-fighting. Then I looked at the dates and saw that though they were both in 1968, Freewheelers saw its premiere in April of that year while Mod Squad did not come out until September. Could there still have been a connection? Sure, but the possible link became a whole lot more tenuous. More likely is what was written in Wikipedia: "Chris McMaster [saw] the popularity of adult action series such as The Avengers and Department S amongst teenagers and saw the potential of a version aimed at a younger audience." The fact that the show lasted as long as it did, staying around for 8 seasons of usually 13 episodes each, showed he was correct. The action drama was only a 30-minute one which is probably why the first season combined several episodes into one adventure. In later seasons, the storyline was extended to encompass the entire season. Sadly, "The first five series were all wiped by Southern, but telerecordings of series 1 and a single episode from series 2 survive." so we do not have the opportunity to revisit the missions. 20 The Zander Plot: Time Bomb! 21 The Zander Plot: Doomsday! 26 The Secret Base: Damocles! 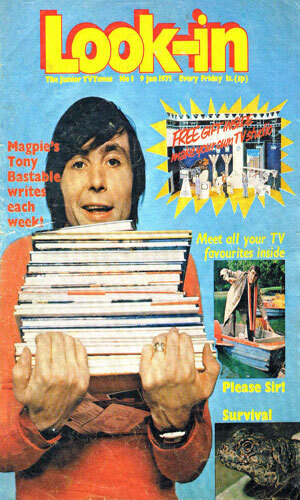 IPC Magazines was a very prolific entertainment publisher in Britain from the 60s until the present. Quite a few different titles showed up under its umbrella through the years and many were popular enough to last several decades. Look-In was one of those successful titles. 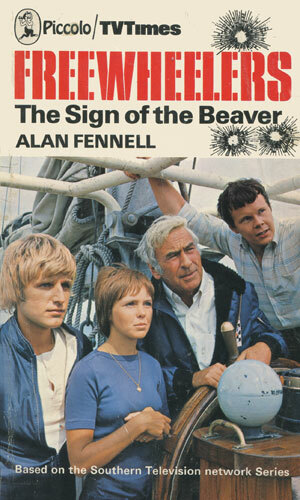 It came into existence in the year 70s and hung around for twenty-plus years. Each weekly issue of 25-30 pages was filled with all sorts of topics about the television industry, all geared to the teenage market. Many articles of the popular shows (American and English) and some movies would be written, often talking about the stars and their likes and dislikes. There would be quite a few comic strips in each as well with most of the serialized adventures having one or two pages of the story in each issue. The Freewheelers would be one of those strips. In fact, they would be in the inaugural issue along with Wreckers at Dead Eye, Crowther in Trouble, Please, Sir!, and Timeslip. Some of these, like the Freewheelers, would eventually be replaced by others. The first 26 issues of Look-In would each have two pages in a storyline. The first tale would last 7 issues, the second would go 8, the third 4, and the fourth 7. Then the Freewheelers would take a hiatus until the end of the year when it would come back for one final, longer story. Then it would disappear for good. Of these 5 adventures, 4 were graphic tales and are represented below. The other one, the 3rd story of the 5, was a 4-page text adventure and can be found in Novellas. Note: the titles for each of these stories is my own. From Look-In v1 #1 to v1 #7 - 14 pages - The trio in the Freewheelers group for this adventure are Max Prentiss, Mike Hobbs, and Sue Craig, working under the temporary direction of Major Tom Graham. The three are offered a good chunk of money to drive a lorry carrying a large crate to a spot in Cornwall. Needing the money to paint their boat, they take it but soon learn, once the box is stolen from them, that it was being used to smuggle an escaped traitor. From Look-In v1 #8 to v1 #15 - 16 pages - Carlos Franger is a enemy of Major Graham, leader of the Freewheelers, and the man behind the backing of rebels in the oil rich country of Rabat. He is about to gain control of the nation and that is something Graham does not want to happen. 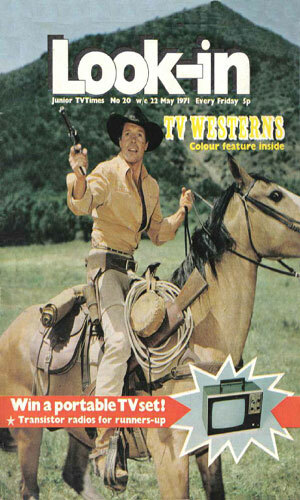 He sends Max, Mike, and Sue of the Freewheelers to that country to be on hand to help stop the rebels. 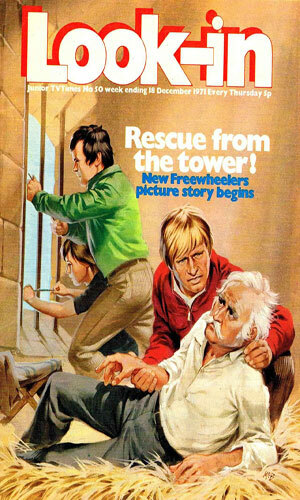 From Look-In v1 #20 to v1 #26 - 14 pages - Heading on a vacation to the northeast of England, the Freewheelers, Max, Mike, and Sue, are surprised to be stopped by a policeman who gives them a directive from Major Graham to head to a castle ruin but what they are to do and who they are to meet remains a secret. From Look-In v1 #50 to v2 #11 -26 pages - A top nuclear scientist in an Eastern European country wants to defect and Colonel Buchan needs the help of the Freewheelers, Mike, Sue, and Steve, to head to that nation and assist in smuggling the man out. 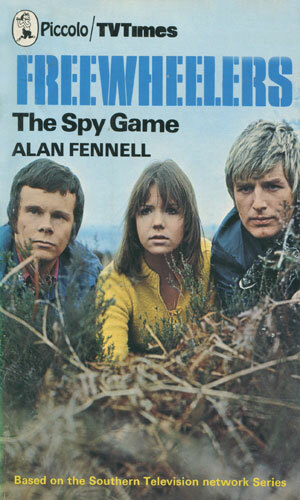 The age I was when this series came out, mid-teens, I would have loved this half-hour action spy drama a lot. Unfortunately, wrong country, wrong continent, so I never knew about it. Looking on YouTube, I do not see much of it other than snippets but those do give a good idea of what was there. The changing of the characters would have gotten annoying, though. The books are pretty good young adult reading and do a good job of capturing what I believe was the feel of the television show. So do the comic books/strips. Worth the time spent reading them.